I hope this delicious, protein-packed snack will make up for the break I have subconsciously taken from posting recipes. The past few weeks have been a whirlwind of testing muffins, entertaining friends in Boston, moving home from Boston, leaving America’s Test Kitchen, many goodbyes and school starting up again. My life is still pretty unorganized – but the kitchen things have been unpacked, so it’s all good. This summer I was given the incredible opportunity to intern at America’s Test Kitchen Boston. I learned a lot about food, cooking, kitchen skills, research and myself. I was challenged and pushed in ways I never have been before. Moving forward, my recipe development will be different than it was before but I will maintain the same style of previous recipes. It may be a slow start, but I hope you will stick with me as I push myself to create interesting, compelling and more creative recipes. Rinse and drain chickpeas. 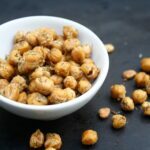 Transfer chickpeas to a kitchen or paper towel and rub to dry. It does not matter if the skins are removed or not, it’s up to you. In a large bowl, combine salt, garlic powder, dried dill and ground dill seed. Add chickpeas to bowl with spices and toss to coat. Transfer seasoned chickpeas onto prepared baking sheet, making sure to get all of the spices that may be left behind. Coat chickpeas with cooking spray and transfer to oven. Bake for 45—60 minutes, stirring every 15minutes, until chickpeas are crisp and no longer chewy in the middle. Remove from oven and transfer to a serving bowl. These are best enjoyed the same day they are made. I like to serve creamy (even spicy) ranch dip on the side. Recipe Note: Don’t have a spice grinder? Use a mortar and pestal to smash the seeds or put the seeds in a zip-top bag and smash with a rolling pin or pan.